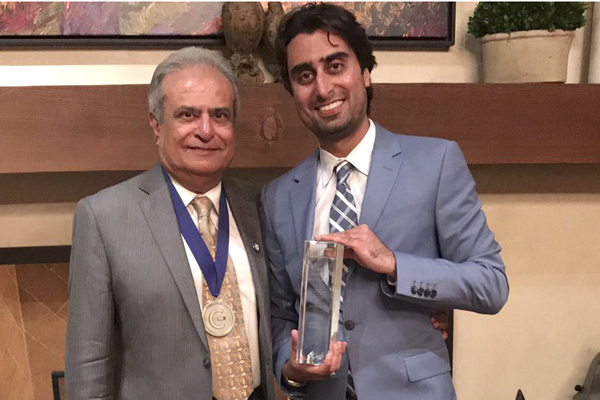 Continuing a family legacy of Bruin engineers, electrical engineering professor Asad Madni and his son, Jamal, are concurrently being honored by IEEE-HKN, the honor society for IEEE, in the same year. Professor Madni (BS ’69, MS ’72) has been selected to receive the Vladimir Karapetoff Outstanding Technical Achievement Award in recognition of his career accomplishments, while Jamal (MSEE ’08, MSBME ’12) will receive the 2017 IEEE-HKN Outstanding Young Professional Award for his past achievements and future promise. “My love for the quantitative began with the national IEEE Jr. Conference where Dad would mentor and attend my technical presentations as a pre-teen,” said Jamal, who is currently working on special projects for Boeing Satellite Systems. Professor Madni currently guides doctoral research in high speed signal processing at UCLA, and previously served in senior executive roles at BEI Technologies and Systron Donner Corporation. I hope this unique occasion will inspire the next generation of alums to continue to honor our electrical engineering department and our school. Professor Madni’s many accomplishments include the Extremely Slow Motion Servo Control System for Hubble Space Telescope’s Star Selector System, which provided the Hubble with unprecedented accuracy and stability, resulting in remarkable images that have enhanced our understanding of the universe. He was also behind the revolutionary MEMS GyroChip® technology that is used worldwide for electronic stability control and rollover protection in passenger vehicles. Professor Madni is a member of the National Academy of Engineering, Fellow of the National Academy of Inventors, a Fellow/Eminent Engineer of 14 of the world’s most prestigious professional academies and societies, and has been awarded five honorary doctorates and five honorary professorships. He is credited with over 170 refereed publications, 69 issued or pending patents, and is the recipient of numerous national and international honors. He is a member of the Boeing Next 100 Team that seeks new technologies and markets for the company, and has been involved in new business capture efforts in laser communications, microelectronics and advanced analytics. Jamal has been recognized with the 2016 SAE Foundation Young Industry Leader Award, the 2016 Engineers Council Future Technology Leader Award, the 2016 Institution for Engineering & Technology (IET) Sir Henry Royce Medal and the 2014 American Society of Engineers (ASEI) Young Engineer of the Year.